After decades of frustration, we have some great news to report. In March 2016, MMAC advisors made a trip to Washington, D.C., to meet with members of Congress. Over the course of a week, they had over three-dozen meetings with members of Congress and their aides, which included meetings with the Armed Services Committee and the House Resources Committee along with chairman Bob Bishop. MMAC advisors Clark Pearson, Joe Martori and Bill Jensen learned that many in Congress share our frustration over issues of access to valuable minerals, Travel Management Plans, habitat designations, mineral withdrawals, etc. All were in agreement – our dependence on foreign sources for valuable minerals and metals is a National Security concern. At the request of Congress, MMAC worked on several bills to restore the rights of miners within MMAC-assisted Mining Districts. The main bill has been written and rewritten many times, and will likely go through another revision or two before it is presented. One of the key members who assisted MMAC with writing their bills is now a part of the Trump transition team and will play a major role in public lands decisions. Toward the end of this month (November 2016), MMAC advisors Clark Pearson, Joe Martori, Bill Jensen and I will be in Washington, D.C., for another week-long series of meetings with influential members of the House and Senate and several key committees, and we should be able to schedule some face time with President-elect Trump and his transition team. We are getting much closer to seeing our legislation passed by Congress. Withdrawals, closures, long delays for Notices and Plans and jurisdictional issues are just a few of the items that we seek to correct on behalf of all miners within MMAC-assisted Mining Districts. MMAC will also be presenting maps of MMAC-assisted Mining Districts to Congress. If you are a claimholder and your Mining District is in disarray, please contact MMAC for assistance so you can reap the benefits of this historic opportunity. After many decades of closures, land-use restrictions, and over-regulation, miners and all other public land users may finally see some real relief due to the efforts of MMAC. Note: MMAC is looking for a qualified MMAC administrator to assist Mining Districts in central California. 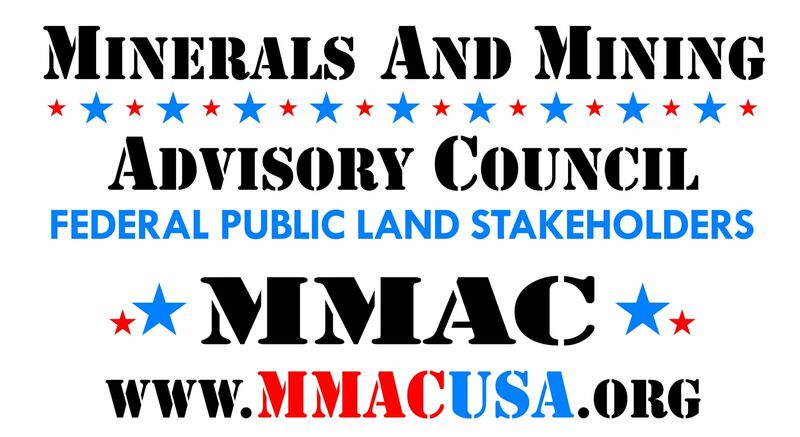 Please contact them via email at miningdistricts@mmacusa.org if you are interested in being a part of history. Training will be provided, and a non-disclosure agreement is required.